If you are looking for self-storage in Calabasas, look no further than the Hollywood Storage Center of Thousand Oaks located in Newbury Park, California to meet your individual, business, furniture or specialty storage needs. Hollywood Storage Center is located at 3425 Old Conejo Road in Newbury Park, CA, only 20 miles or 27 minutes from Calabasas just a ½ mile off the 101 freeway. 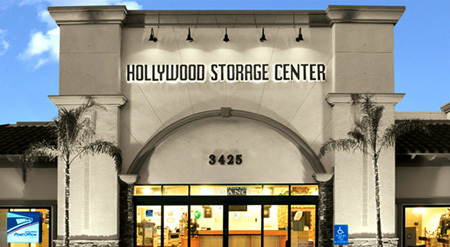 The Hollywood Storage Center is the only immaculate, modern storage facility in the Conejo Valley (consisting of the cities and communities of Thousand Oaks, Newbury Park, Westlake, Westlake Village, Oak Park, Agoura and Agoura Hills) that boasts a staff seven days a week including extended weekend hours. No other storage facility offers 50 sizes and the variety of specialty storage and conveniences to choose from at the lowest price – guaranteed. Hollywood Storage Center offers a myriad of business storage options and services to support your business seven days a week. Services range from Penske truck rental to access to our fully-equipped conference room and use of the U.S. Postal Service Station. Hollywood Storage Center has three storage buildings with indoor climate-controlled units in a variety of sizes for items sensitive to temperature fluctuations. Note: Items recommended for climate control storage are: wood furniture, photos, printed materials as well as videotapes, music media and instruments. (Contact our office for a complete list of recommended specialty storage items). Your most prized possessions are safe at Hollywood Storage Center because of their high-security, climate-controlled storage rooms; each one individually alarmed and carpeted. Valuables such as artwork, antiques, and collections can be stored in these rooms or in a safety deposit box. Access to vaulted items is seven days a week from 8:30 a.m. to 6 p.m. If you need storage for your RV, boat or perhaps vintage automobile, look no further than Hollywood Storage Center. We offer safe and convenient indoor or outdoor storage options your individual storage needs. Hollywood Storage Center proudly offers FREE responsible electronic recycling; e-Recycling through partner, All Green Electronics Recycling, to make sure unwanted electronic equipment and their hazardous materials never end up in landfills. Obsolete, unwanted electronics can be dropped off seven days a week from 8:30 am to 6 pm. Who Owns the Hollywood Storage Center and why the name? The Hollywood Storage Center (previously called Thousand Oaks Self Storage) was originally built in 1979 and has continued to upgrade and add new buildings, expanding its space and services to better meet community needs. The facility is owned and operated by a Los Angeles family partnership that spans three generations. Since 1965, the company has built and operated businesses that are leaders in their industries and are socially-responsible within their communities. The company created the Hollywood Wax Museum; hence the name Hollywood Storage Center and emphasis on a memorable customer experience. Thankfully, your experience at Hollywood Storage Center doesn’t cost more, you just get more... we guarantee it! If you find an identically sized self-storage unit at a comparable storage or mini-storage facility in the Conejo Valley or at another Calabasas storage facility with a better price than ours, we won't just match it, we will beat it! Need storage in Calabasas, California? You’ve come to the right place! Call us at (805) 500-4542 (sales) or (805) 499-2700 (customer service). Our office is open seven days a week to serve you.